The stones on this page are all unpolished slabs and rough stones with Sagenite, or what looks to us like Sagenite. We charge one shipping cost for all that will safely fit in a Small Priority Flat Rate box or padded envelope and will ship to the U.S. as well as Internationally. See our Store Policies for full details. We don't have much with Sagenite, but we do have a few more. We should have them photographed and available soon. 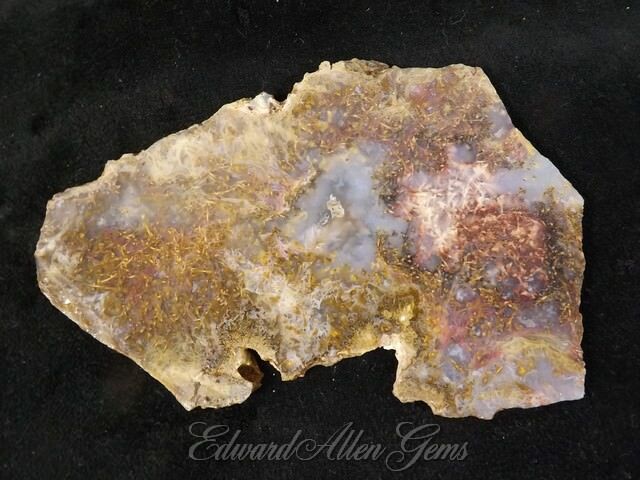 This is an agate slab with small Sagentie needles in it. We have no clue where the material was originally collected, just another very neat slice from an old stock collection. It is about 5" x 3 1/4ŗ at the widest points and 6-8 mm thick. It weighs 152.2 grams, or 5.4 ounces. First Class Shipping for less available upon request. This Agate slab appears to have a lot going on! There are several small blue agate pockets, some yellowish splashes mixed with browns and black, and then these wisps of Sagenite needles, some flowing one way, some flowing another. Despite a few pits and rough spots, it is a very neat piece with lots of potential. It is roughly 5 1/2" x 4" at its wider points, and mostly 8-9 mm thick. It weighs 241.6 grams, or 8.5 ounces.